Follow Pete Moss in this magical, beautifully illustrated story as he attends boarding school on Bloomers Island to learn about gardening and growing his own vegetables. When Professor Sage announces the Very Very Veggie Challenge, Pete immediately knows what he needs to grow spinach. It’s the one vegetable that can make him stronger. But does Pete have the patience to grow his spinach plants to win the contest? 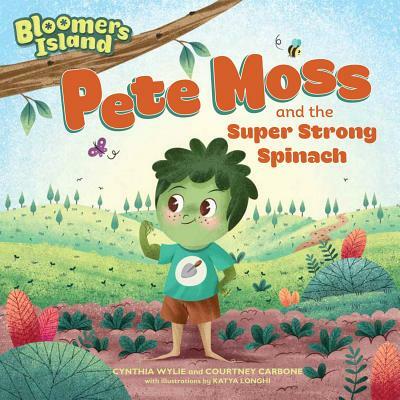 With the help of headmaster Professor Sage and his fellow Bloomers, Pete learns all about spinach, working hard toward his goals, and that good things take time to happen! The Bloomers Island series brings to life the world of gardening and healthy-eating to young children in new and exciting ways. Cynthia Wylie grew up on a farm, where she developed her love for all things green. Along with inventing unique gardening products, she has taught thousands of children how to garden. She has also raised four vegetable-eating children of her own in Venice, California. Courtney Carbone is a children’s book writer in New York City. She enjoys spending time in botanical gardens and farmers’ markets, as well as planting her own garden. She especially loves lemons, avocados, and dahlia flowers. Katya Longhi is a children’s book illustrator for publishers across Italy, Australia, the United States, France, and Brazil. In addition to collecting picture books and snow globes, she loves unicorns and anything magical. She lives in Italy with her husband and can be found online at katyalonghi.com.